ISLAMABAD: The European Free Trade Association (EFTA) – a regional trade organisation and free trade area consisting of four European states Iceland, Liechtenstein, Norway and Switzerland- has shown interest to sign Free Trade Agreement (FTA) with Pakistan, Pakistan Today has learnt. According to sources, EFTA has asked to start negotiations on FTA as they want to enhance trade relations with Pakistan. Pakistani officials in Geneva are in touch with the four countries block representatives in this connection. The value of EFTA-Pakistan merchandise trade, imports plus exports, amounted to $573 million in 2017. Pakistan’s export volume is $218m to the four-country block while the exports are worth $355m. The four countries import products worth $360 billion on yearly basis; however, Pakistan’s share is just 0.7 per cent of the total import. Its exports consist mainly of textiles and apparel whereas, top imports include pharmaceutical products, machinery, watches, and precious stones. 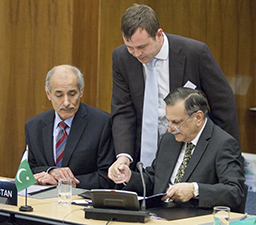 Earlier in 2012, the EFTA States and Pakistan had signed a Joint Declaration on Cooperation. Sources said that Pakistan can get a huge market, especially in Norway, as nearly 40,000 people live over there. Statistics show that the bilateral trade between Pakistan and Norway, an important partner of EFTA, was $128 million in 2017. Pakistan exports to the Norwegians were $105 million whereas, Norwegian exports to Pakistan were $19 million. “EFTA is also making negotiations with neighbouring country India in a bid to enhance trade relations with Asian countries,” officials told. The EFTA has signed 29 FTAs with 40 counties outside Europe and the EFTA States have also signed a pact with European countries which covers four freedoms — the free movement of goods, services, persons and capital — throughout the 31 EEA states. In addition, the agreement between the EFTA and EU also covers cooperation in other important areas such as research and development, education, social policy, the environment, consumer protection, tourism and culture, collectively known as “flanking and horizontal” policies. The agreement guarantees equal rights and obligations within the internal market for citizens and economic operators in the EEA. The EFTA Member States signed a Comprehensive Economic Partnership Agreement (CEPA) with Indonesia in December 2018. The agreement will strengthen economic ties and promote trade and investment between the two sides.